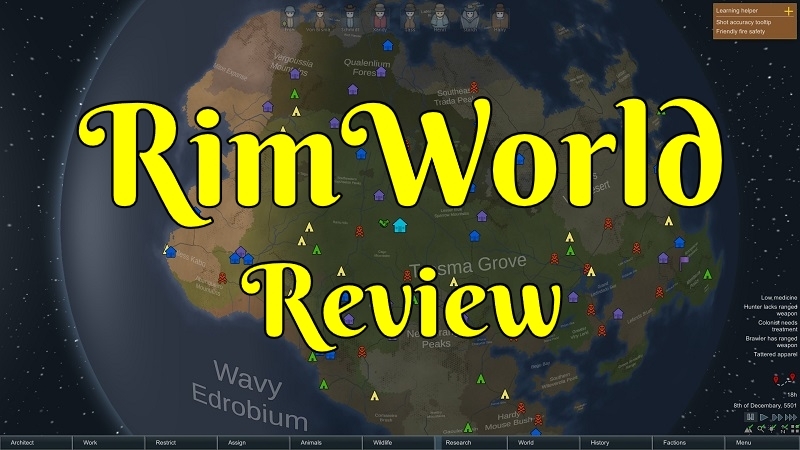 Rimworld is a sandbox survival game with a heavy focus on building and managing your people. All while you deal with an AI creating challenges for you to overcome and lending a helping hand with things go sideways sometimes. One of the biggest things you notice right away is how your game is going be impacted by which of the several AI’s you have to choose from. The idea behind them is they are supposed to be like storytellers. I don’t quite feel sold on that concept of them telling a story. I’m also not quite sure about the whole “AI” part either. They more or less just cause things to happen which is what happens in survival genre of games anyways. What they do for certain is control how difficult the events that occurred while you are while playing and how long you get to try and recover. 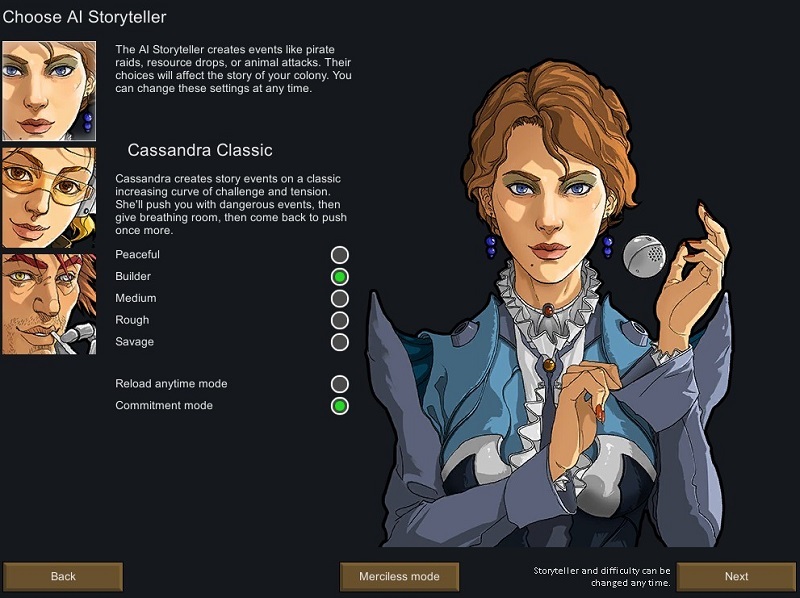 You can go with more standard gameplay where the difficulty increases over time with Cassandra. Another one named Randy is more random between how easy or difficult the challenge he presents you with. Finally you have Phoebe who seems really great for someone new to this game since she’s a bit of a pushover at the start; however, later in the game, she makes up for lost time. They end up controlling things like radar attacks, storms, how harsh the weather is. They could help you out with resource drops or send a caravan selling something you need your way. If things go really bad you could end up with a new member that might be able to stabilize or at least let you keep playing when everyone dies. They seem to keep you on your toes but also provided a bit of an insurance policy if you were not quite ready. I suspect that the whole storyteller part comes in when you surviving to keeps the story going. I remember once a fire broke out and all my people become unconscious trying to fight it to keep my entire building from burning down. Suddenly out of nowhere a new character appeared and started walking towards my base. He was able to save one of my members but everyone else perished in that fire. Another time I had captured some raiders and wanted to convert them to join my side. I had them for quite some time and was almost to the point that recruitment would be successful. One night a thunderstorm broke out and hit the rooms they were being held in. The fire was so massive I did not stop there section in time from burning away. My prisoners escaped and were never seen again! I think this is a fun way to give the player some choice in how hard or random the kind of events you could get is. I just did not feel like they were really telling storytellers in how I see it personality. The game does provide a little bit of text but overall that aspect of them felt a bit weak. If you are someone who loves setting up zones, managing task priorities, drug permissions, and other administrative stuff. There is some fun to be with that aspect of the game. Once you do have everything sorted out, for the most part, you can set and forget while your people go around doing what they are best suited for while remaining active. The game itself lets you set up different zones that can control who or what is even permitted in them. Along with things like is this storage area and even what items are or are not permitted in them. For example, I have an area I turned into a freezer to store food in and any none or rotted food is not permitted in that area. 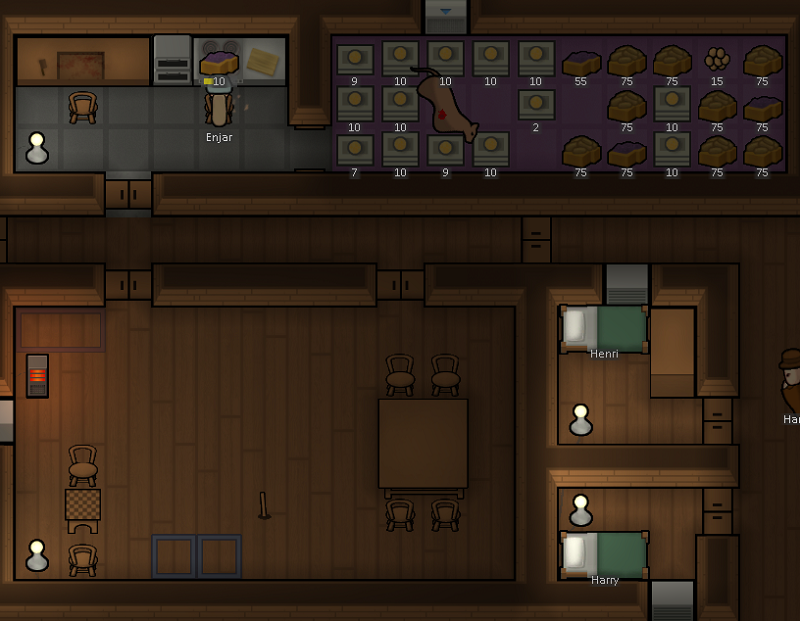 I’ve almost made it so any tamed animals are not zoned to be in there to avoided them from eating all higher-end food. There is quite a wide range of tasks that your members can perform from being a doctor to cleaning blood and other stuff up. The game lets you set up from 1 to 4 or none of what priority that specific team member should consider a task to have for them. I have one member that has inspiration when doing research and gain that skill much faster. While over half of my members cannot even clean! I’m not quite sure how they managed to get by in life without the ability to clean. This also means if you have no one that can play the doctor or cook role you are going in for a hurting. You could if you really wanted to set up a daily schedule for each member you have. You can pick when that person sleeps, works or even takes a break. Some are night owls and gain unhappiness when working during the day. While others will be so focused on the task at hand they don’t relax. The last thing you want is one of your people to be so unhappy they go on massive berserk and burn down the entire complex or cause other kinds of damage. 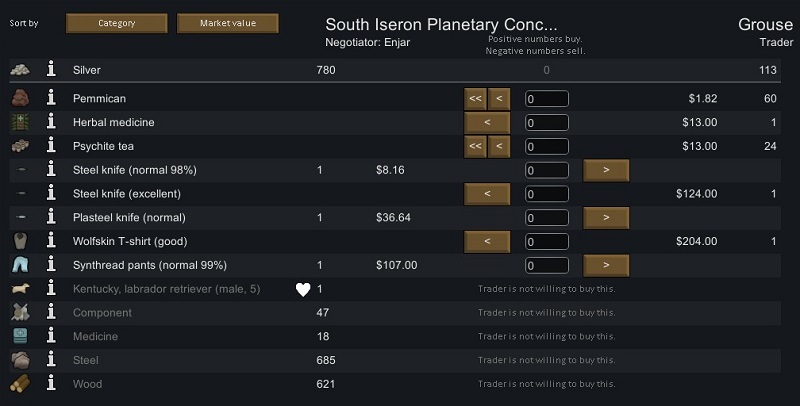 I found in the early game where you only start with a couple of people you tend to micromanage a lot more. Since you lack enough manpower to have just one person highly focused on doing one task whenever it arises. As you gain more and more members you tend to have your highest skilled members for one job like cooking doing the bulk of it unless more help is needed. Things then become more managed by your settings and not so much by you changing them to get more people on a task. While you start off building for necessity over the long run I found myself focusing on usability, happiness benefits, defense, and efficiency. There are many pros and cons to consider even for the type of complex or village you end up building. For items that sit outside, they end up being eroded by the elements. I find this element of realism to not be too harsh as the game does give you quite a few in-game days to haul things indoors. This also gives the player a reason to set up designation areas for storage and become organized. This tends to solve that issue of never finding where something was put that other games suffer from. I myself went for one massive building for my main members. This does have a major drawback that a single fire could wipe out everything I own. I have the main storage more in the middle but still protected with a couple of side storage rooms in different locations. There is only one door in so any raiders that show up will either have to use it or blast a hole in somewhere else. They tend to go for my “unprotected” power grid which is where I send my guys with guns to ambush them. Beds can play a big factor in what role a room plays which was a fun and interesting way to go about define some areas. They can be set up for personal use such as a bedroom, for medical for making healing ward, and for prisoners to set up a holding area. Giving the player this kind of control lets you focus on happy or safety benefits a room can provide. For a personal room, you could have artwork inside to create a happy sleeping area. For a medical ward, the flooring in there could be geared towards keeping it clean and easy to maintain. While a place to hold prisoners just needs the basics. When setting up areas a really interesting thing to consider is workflow. Do I want the area I have set up as a freezer to be an extreme distance from my dining area or kitchen? Naturally, since those tasks take a very short amount of time to perform I want them close. I don’t find it a big deal when someone has to walk to the other end of my buildings to pick up supplies they need for a long task like creating art. With all the options the game gives things you might not consider suddenly become part of your strategy. You also have things like power generation, storage, and usage. The game gives you quite a few options and not all of them are affordable or unlocked from the start. You can burn wood, have a solar or wind farm. You could even harness geothermic vents if they happen to be in the area you settled in. With the amount of power you have when you start thinking about air conditioning in the summer to prevent heat strokes and heating in the winter to prevent hyperthermia. These systems while they do use a fair amount of power. Only a couple of solar panels with a battery bank and you are good to go unless disaster strikes. I did find in the early stages that I was choosing what rooms would even be heated or chilled or just not at all if I could get away with it. The building aspect really has a great sandbox feeling to it. The only drawback I can see is with the game being two-dimensional it’s all on a single layer. So you end up growing out instead of taller. As you can see from my one complex I can’t solve growth issues by building up. I either need to make another massive hallway around the center or build another building. One part I never pay much attention to in my number of playthroughs is politics. 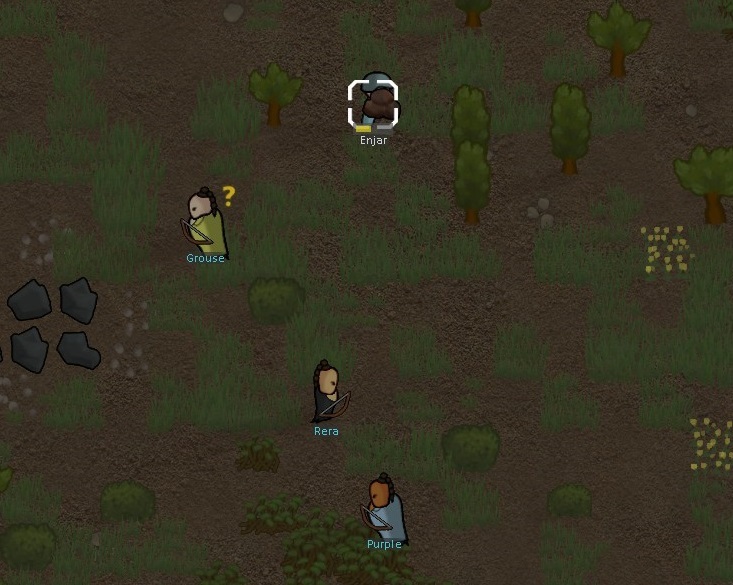 There are factions in this game and over time they do become hostile and send raiders to attack. You can also trade with other factions or go raid them yourself. The map in this game is a decent size and the fact I don’t interact with it more tells me there a whole lot of game to still enjoy. You do get traders that show up from time to time to your area. All items are sold in exchange for silver which you can mine for or just sell items to acquire. The game even has a social skill that you can use to get better prices among other things. Some traders might be arms dealers while others are more genic bulk goods. I tend to be more independent and just craft what I need. 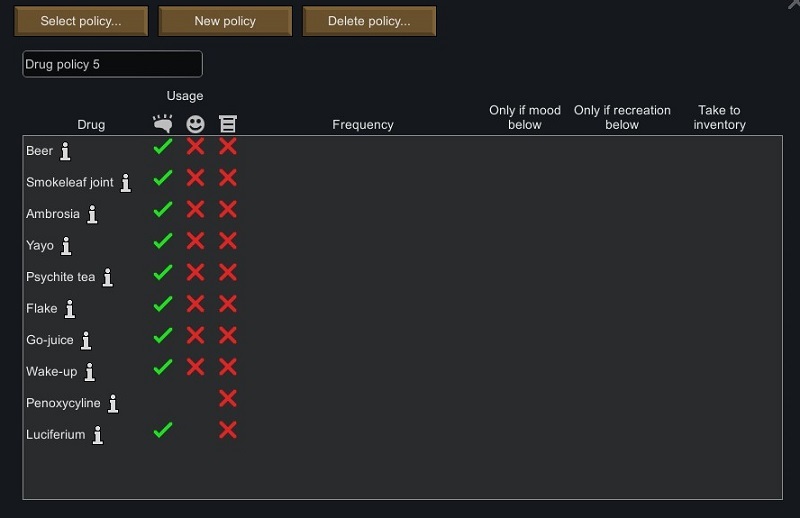 So once I’m out of the early game I don’t check the traders unless I really need medicine or I can’t craft weapons yet. You can even assemble caravans of your own to go out into the world. There are missions that pop up from time to time for trades, resource, and theft. Even the end game goal is going require you to leave your starting area and start heading towards those objectives on the map. Each area itself only has so many resources so I could see myself running out of ores one day. Along the way, you might find yourself needing resources that are not available in my area. Where you end up starting at can keep you occupied for quite some time. The fact that I can just focus playing the part of the game I enjoy and don’t have the urge to vendor out so far has been great. I find it interesting the amount of organization and order you can bring to your community. Then you have that more protagonist AI that can just cause destruction and mayhem to those plans. This one definitely did take trying to survive to a different level than most games in a similar genre. There is more to it than just trying to survive past winter and staying clear of some crazy animal roaming the lands. 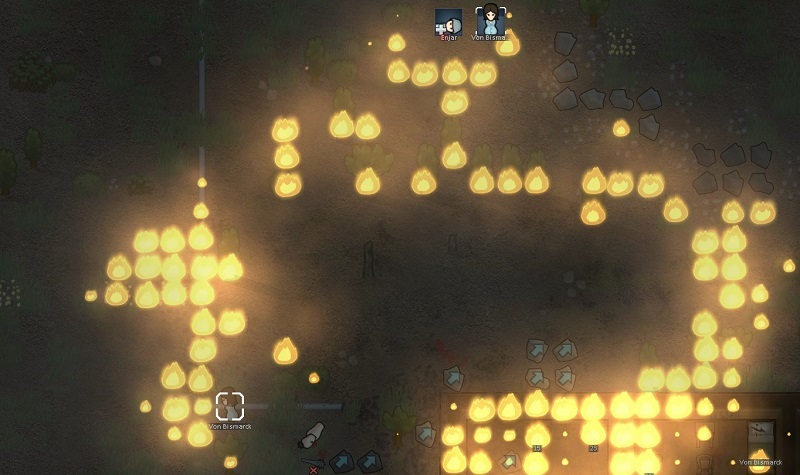 An entire prisoner break could be caused by a lightning strike burning everything down. Meanwhile, an endless amount of solar eclipse keeps you in the Stone Age unable to advance without power. All of these things you just can’t predict when and where they will happen.